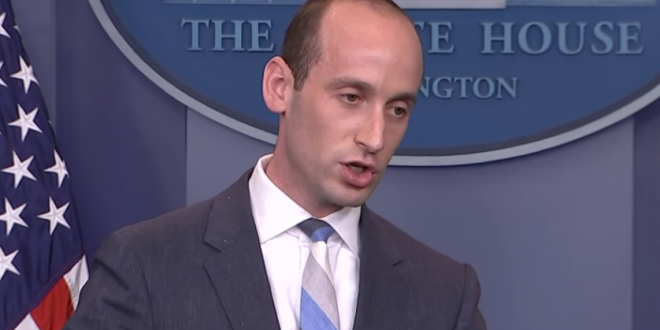 Teacher Suspended For Saying Stephen Miller Ate Glue - Joe.My.God. Stephen Miller’s third-grade teacher, who said earlier this week that the Trump aide was a glue-eating “loner,” has now been suspended. Nikki Fiske, a veteran teacher in the Santa Monica-Malibu Unified School District, has been placed on “home assignment” after penning an essay in which she described a young Miller as a “strange dude” and recounted a story of him eating glue as a student. I can still picture him sitting in my classroom. Do you remember that character in Peanuts, the one called Pig Pen, with the dust cloud and crumbs flying all around him? That was Stephen Miller at 8. I was always trying to get him to clean up his desk — he always had stuff mashed up in there. He was a strange dude. I remember he would take a bottle of glue — we didn’t have glue sticks in those days — and he would pour the glue on his arm, let it dry, peel it off and then eat it.